I went to the March Madness sale at Woodcraft today and came home with a new benchtop drill press and I grabbed up an Orion mortising attachment while I was there. I caught the eary bird part of the sale so I got an additional 5% off. The drill press retails at Woodcraft for $249.99. For the eary bird deal they take the additional 5% off after they apply the 10% discount so it ended up costing me about $214 before sales tax. 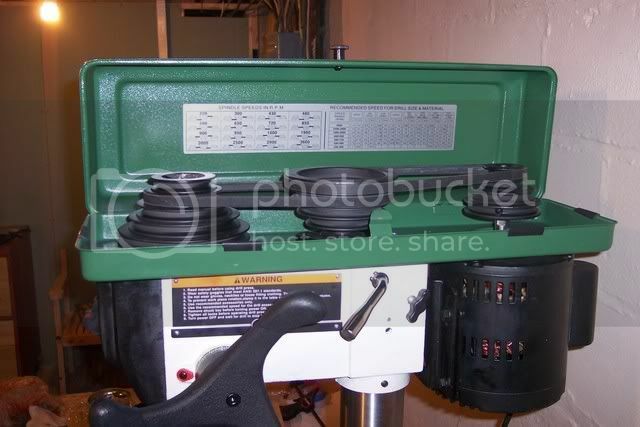 It’s a 13” drill press with a 1/2 hp motor. Pretty much all the benchtop drill presses I’ve been looking at had 1/3 hp motors and I have to say that the bigger motor definitely drew me to this one. They also had a smaller Rikon (I think it was 12” with a 1/3 hp). It went together smooth as silk, there wasn’t much work to the assembly at all. Just bolt the column to the base, slide the head on the column, attach the hand wheel, install the belts, slide the chuck on the arbor and drive it home with a mallet. It’s got 16 speed settings ranging from 220 rpm – 3600 rpm. Changing speeds is a pretty standard belt/pulley type adjustment. The base and the table are cast iron with a steel column. It is definitely sturdy and runs vibration free with a very quiet motor. Table height adjustment is smooth and requires very little effort but the worm gear is a little sloppy. The table rotates 360 degrees around the cloumn without a problem and has a 45 degree tilt left and right. 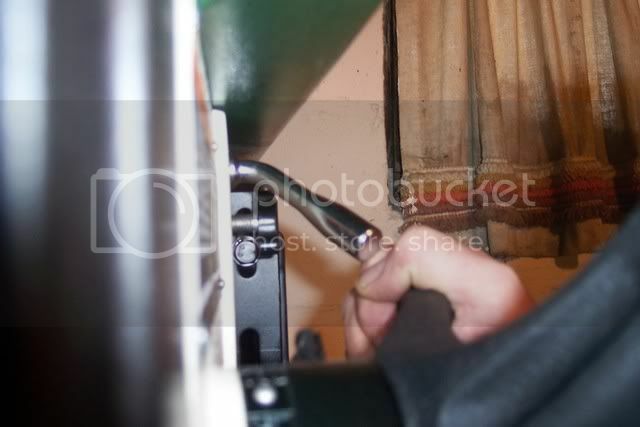 In order to adjust the tilt you have to get up under the table with a wrench and the locking nut is not the easiest to get at but it works and holds the table securely. On the down side. The hand wheel is cool to look at but it doesn’t give you a lot of leverage, you almost feel like you need to put two hands on it. The on/off switch is right out in front of you and easy to get at but as far as controls go, thats the only one that’s easy to get at. It’s got a clutch type depth stop that is set with a thumb screw on the hand wheel. Using it will be a challenge if you’ve got big hands. It does have a tension adjustment handle for the belts wth locking knobs so tension adjustments are easy and can be done without wrenches. 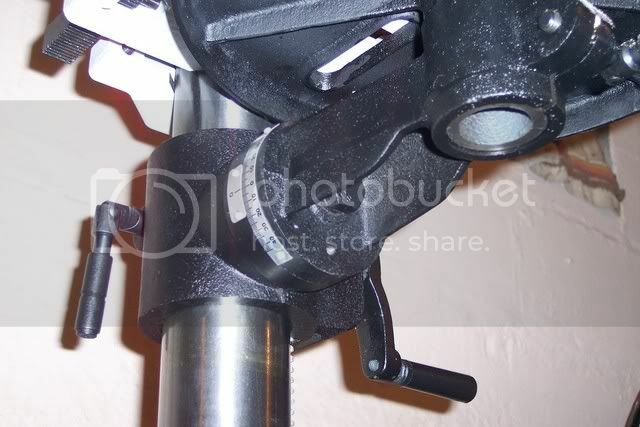 But the tension adjuster is mounted right behind and painfully close to the handwheel. It’s a knuckle buster for certain. I also learned that it’s got an odd sized quill which makes installing the Orion mortisng attachment a bit dicey. Mortising attachments seem to be sized for quill diameters of 2 5/8” with adapters to fit 2”, 1 7/8”, and1 1/2”. The quill on this press is 2 3/16”. The Orion mortising attachment retails for $119, after the sale it cost me a little over $100. You can make it work on this press if you use the 2” adapter and get up on the spindle just above the quill but then you’re only clamping down on the bottom half of the adapter and you don’t really have enough room at the chuck, especially if you’re using smaller diameter mortising bits. I’m going to solve this problem with a visit to the machine shop to have a custom adapter made. 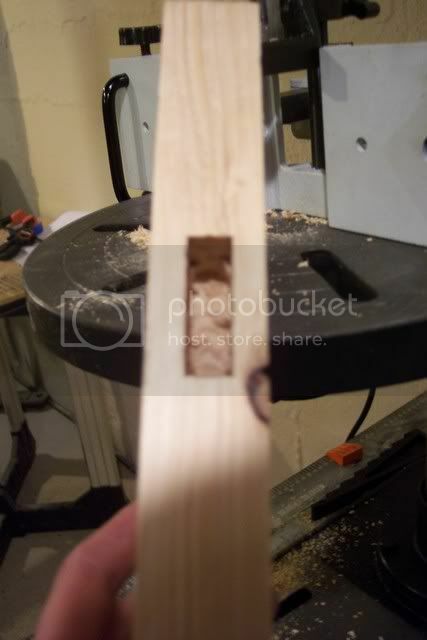 I was able to get the 1/2” mortising bit in it and run a couple of test mortises. The funky handwheel on the drill press gets in the way of the clamping lever on the mortising attachment so you have to angle it slightly to make things a little easier. I really like the fence on the Orion. The supports and hold downs are sturdy and easy to use. 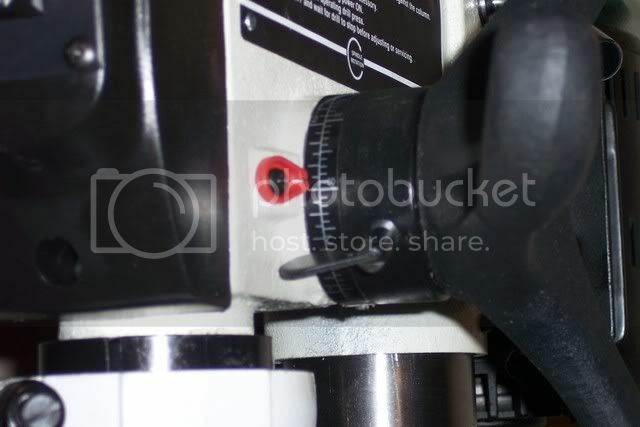 The fence attaches to the drill press column and has a gear driven depth adjustment. They call it a micro adjust but I think that’s being a bit generous. It was very sloppy when I first assembled it but there are adusting screws that let you dial it in. After I did that it was tight and smooth. The Orion comes with 1/4”, 5/16”, 3/8”, and 1/2” chisel and bit assemblies. The ones that come with it are ok but I can see myself picking up a set of CMT’s at some point in the future. All in all I think the Rikon is a good drill press for the money and Orion mortising attachment is definitely a keeper. -- I've cut that board three times and it's still too short! 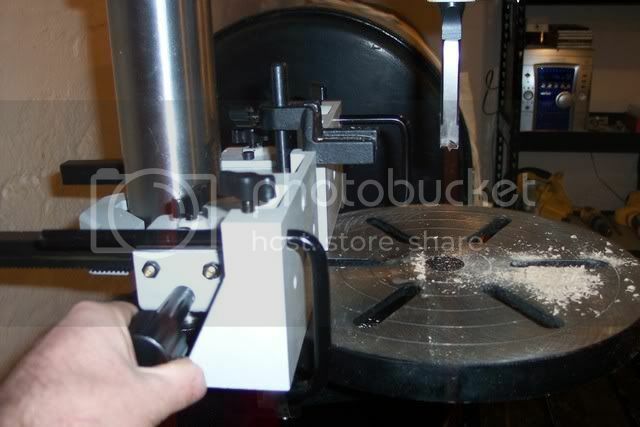 I’ve seen a lot of mixed reviews on the mortising attachments for drill presses. I’m glad you found one that works for you. Overall, it sounds like you got a couple of good deals. nice review. it seems like a good drill press. speaking of bench top drill presses Craftsman has one that has 2/3 hp with 3+ inch stroke (good reviews also) on sale every once in a while for 149.99 dollars. good luck with your new toy.. I hit the madness and got a bunch of stuff I needed too. I’ve gotten a mixed bag of reviews on mortising attachments too junior and I was on the fence about buying it. 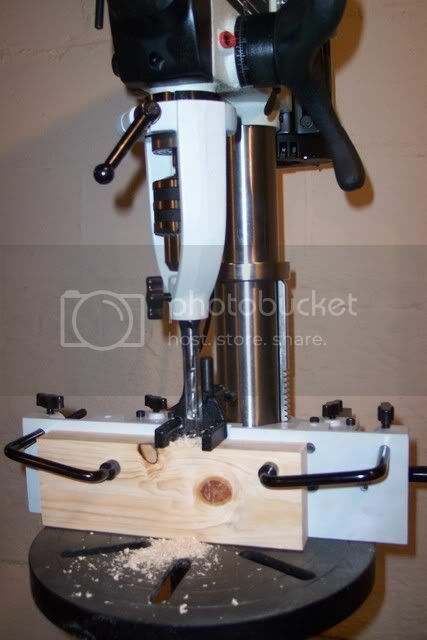 I originally set out to buy a mortiser but my drill press desparately needed replacing. I picked it up from a buddy about 10 years ago, he had it for about 5 years and originally scavaned it from a machine shop that was closing it’s doors and god knows how long they had it. The motor was starting to smell burnt if I ran it too long and because the motor was a goofy frame size a replacement would have cost me $150 so I decided to retire it. All the mortisers that I was looking at had 1/2 hp motors and since this press had the same size motor I decided to give it a shot and see if I could kill 2 birds with one stone. 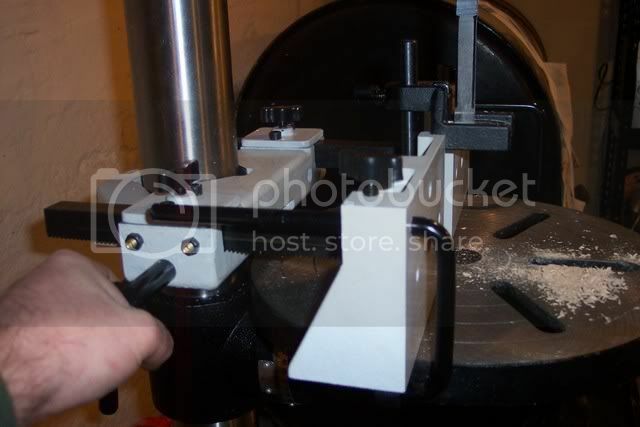 I have to say that there is a phenominal difference between the amount of leverage you get with the handle on a mortiser vs. what you get with this press though and I still haven’t had a chance to really run it through the paces because of the adapter issue, so I may still be dissapointed with my decision. Good deal! Don’t run out & buy the CMT bits till you give the original bits a good sharpening. See Karson’s post: http://lumberjocks.com/reviews/product/259. I bought some high $ bits only to find out after sharpening the originals that they work just fine in qswo. Keep us updated shaun. I’ve been looking at both but there’s just something about spending that much cash on a machine that does only job. I took some time to look at your projects you’ve posted and I wanted to tell you that I think you’re doing some great work. And loved your writing about the air compressor. That’s a victory for us woodworkers….... Thanks for the reply. Your Mortise attachment looks good. I bought one a few months ago and just have had hell with it as the arbor kept rattling out , after applying a heavy pressdown to tighten it in i broke the table clamp, all fixed and welded. it works ok now. So my thoughts are if you have lots of mortises to do then a dedicated mortiser is better however your set up looks strong . Very well done review I really appreciated the use of the photos like they ,say a picture is worth a thousand words. I went ahead and went straight to a dedicated mortiser, I have the Jet floor model, and I do love it, and have no regrets what so ever. What I really wanted to know is, what do you think about the Rikon seen as some time has now past? I have a real piece of crap 17” Delta floor model, I have had trouble since the moment I first touched the box it came in. down the defective bolts and send replacements. 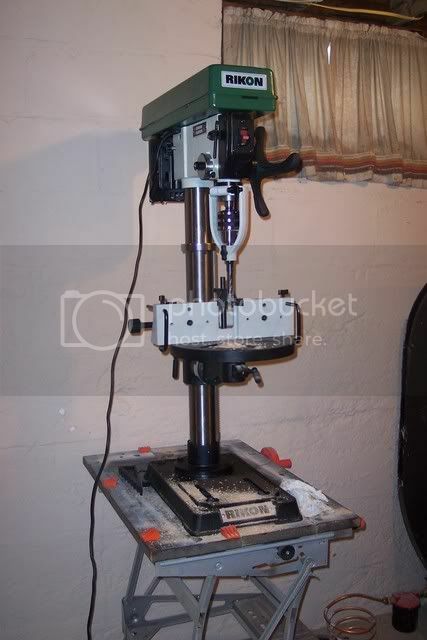 I have a Power Craft Pro Gold Series 16 speed drill press that looks identical to this one, except no goofy feed handle, on/off switch on the left, and a cream-colored housing for the drive belts. I bought it used, and appeared to be in great working order, except when the spinning bit is put under a load, the front belt skips – I can’t get enough tension on the thing. I suspect that the tension lever is broken. When I turn it it seems to not engage anything. Any experience with this on your Rikon? My next step is to dismantle and troubleshoot, but want to avoid that if necessary. 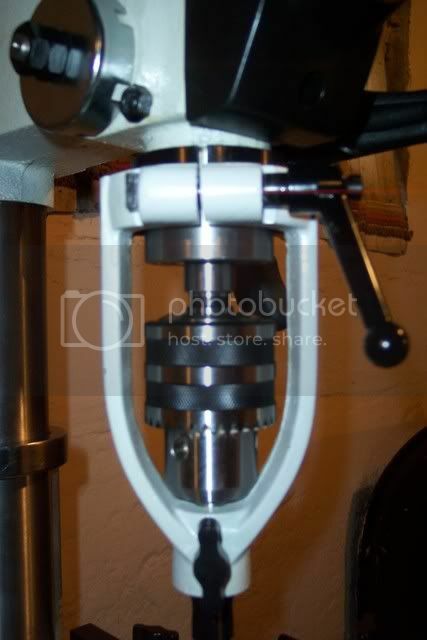 Thanks for putting such a solid Rikon Drill Press Review together. Love the photos! Looks like you got yourself a bargain there. Hi, I only joined and/or posted here to get the word out that as a recent Rikon 30-120 purchaser, I as well did not like the cast iron heed handle. In reviewing parts lists for their other models, I noticed that the feed handle on the 30-140 looked like it may be able to be used on the 30-120. I emailed the company and they responded that it is possible and has been done. They shipped out the parts to me for around $40. The installation is incredibly simple and takes about 5 minutes. 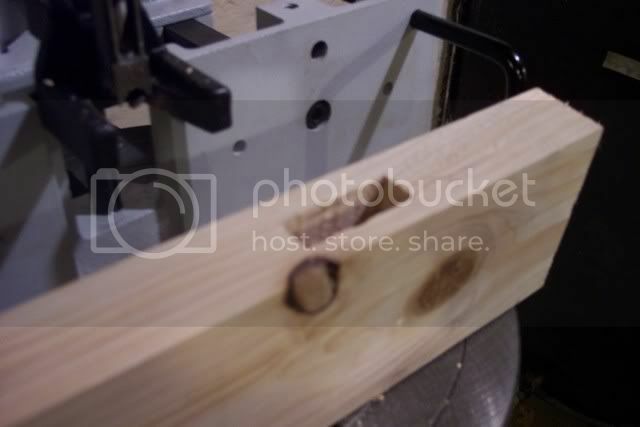 Firstly, remove any bits and lower the work table so the chuck can bottom out without hitting anything. The old hub is connected to the feed handle and passes completely through the head unit and comes out on the other side. There are two nuts that thread on to the hub and hold the torsion spring cap/spring in place. Remove the outer lock nut, and then carefully remove the second nut, not dislodging the torsion spring cap. The torsion spring is under constant tension and so must be removed carefully. The spring cap is notched and there is a “bump” cast into the head unit that the notches lock on to. Using the tab of the spring sticking out of the spring cap for leverage, firmly take hold of the spring cap and wiggle it off of the bump so then you can release the tension in the spring by letting the cap spin freely in your hand. Do a little at a time for obvious reasons. The quill will now drop freely and bottom out. The hub and feed handle can now come out at this time. Slide the hub out of the head unit and remove the depth stop from the old hub and place it on the new hub and tighten. Insert the new hub/depth stop into the head unit until it seats in place. The hub shaft is threaded and split on the end where the spring goes. The split is how the spring maintains its tension and returns the feed handle up. Guide the end of the spring into the split (mine took a little coercion) and slide the spring/cap onto the shaft until it is near the head unit. Thread the first nut onto the shaft just so it has some bite. (This will save time and effort when you need to lock down the spring/cap when you get the tension wound up). Start winding the spring by turning it counter-clockwise. Use the notches in the cap to lock onto the bump so you can readjust your hand and keep winding. Eventually, the quill will be drawn back up. Turn the nut you threaded on the hub until it holds the spring cap in place. Install the 3 feed handles onto the hub and tighten. Feed the quill down a few times and ensure the quill snaps back to the top when you release. If it doesn’t, loosen the lock nut enough to continue winding the torsion spring. Once you get sufficient tension, lightly tighten the nut, and install the second nut and lock that down onto the first. If you tighten the nuts too much, you will not be able to feed the drill, or it will be difficult. Simply loosen the outer nut, and then loosen the inner nut until the feed is smooth and easy. Retighten the nuts. You are done. Enjoy your new feed handle.